By Alan Green in Cadence Minerals (KDNC) on 16th January 2019 . Cadence Minerals (AIM/NEX: KDNC; OTC: KDNCY) is pleased to note that Macarthur Minerals (TSX-V: MMS) (“Macarthur”) has provided a further update on the results of its drilling of high priority nickel sulphide targets at its Lake Giles project in Western Australia. 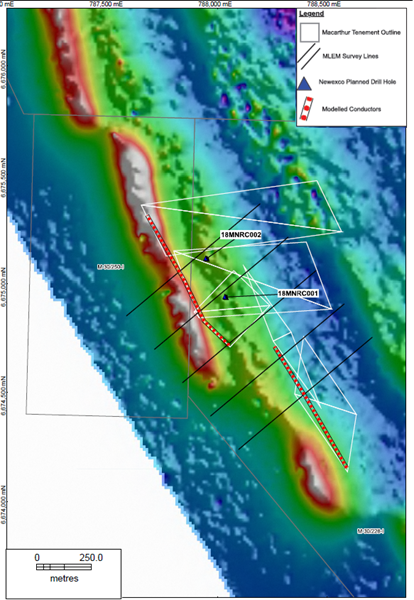 Surveying at targets derived from recent geophysical surveys using Moving Loop Electromagnetics (“MLEM”) successfully delineated two bedrock conductors, MC01 and MC02 at Moonshine, with a further bedrock conductor identified at the Snark prospect. 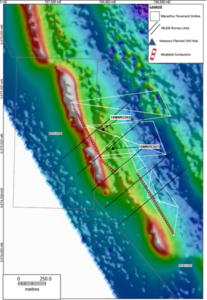 Results for the two Reverse Circulation (“RC”) drill holes completed at Moonshine North have returned encouraging assay results. Anomalous nickel in hole 18MRC001 with average of 0.2% Ni over 31 metres (“m”) from 26m. Potassic alteration indicated in hole 18MRC001 from 140m to 146m (20% Potassium content) marginal to the sulphide intersection in the hole. Anomalous gold associated with sulfidic chert in interval 106m to 113m (average gold content 159 part per billion (“ppb”) over the interval). Prior to Macarthur’s acquisition of the Lake Giles project, there were two previous periods of limited exploration activity for nickel over parts of the present tenement package. The recent review and evaluation of geochemical and geophysical data has identified significant exploration targets for nickel. These targets include some fifteen areas considered prospective for discovery of sulphide style nickel within the belt of ultramafic rocks. Mr Ian S Cooper, B.Sc., A.R.S.M., F.G.S. FAusIMM, a Fellow of the Australasian Institute of Mining and Metallurgy (membership number 107348, is a consultant of Macarthur and is a Qualified Person as defined in National Instrument 43-101. Mr Cooper has reviewed and approved the technical information contained in this news release.